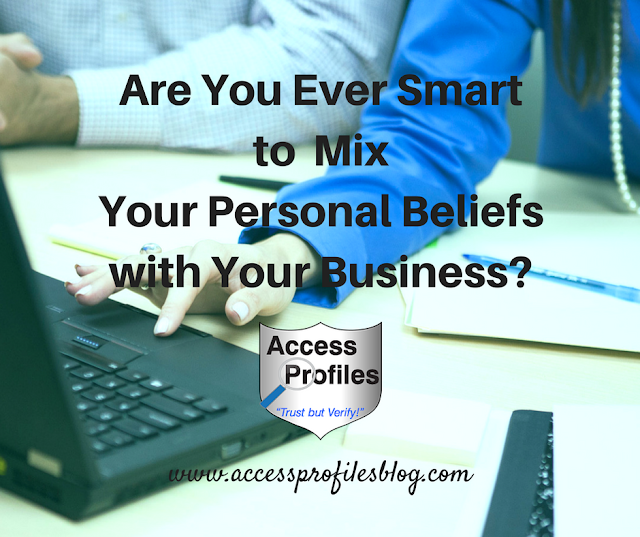 Are You Ever Smart to Mix Your Personal Beliefs with Your Business? at least for the most part. 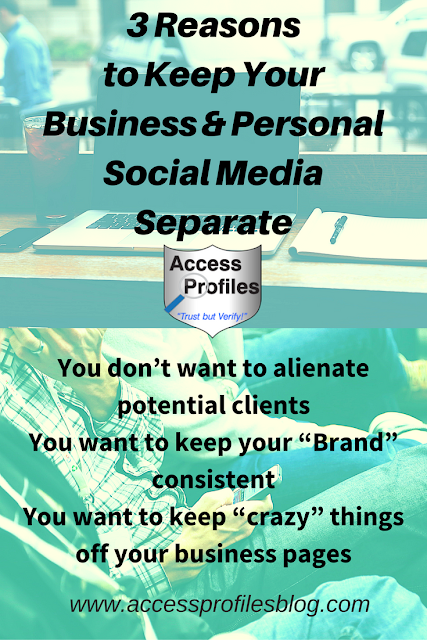 Too much mixing of the two can lead to alienation of potential and existing clients, blurring of your “brand”, and even result in less than desirable posts finding their way on to your business social sites. You can find more of my thoughts on this in “Why You Need to Keep Your Personal & Business Social Media Separate”. But, even for me, the need to keep the personal and business side of my life separate is not always the case. Occasionally I share personal stories and my take on current issues ~ especially those relevant to me and my industry. However, there is one time when I think it not only makes sense, but is actually smart, to mix your personal beliefs with your business. with a cause, or two, that you truly believe in! When Sharing Your Personal Beliefs is Good for Your Small Business! "Tweet This"
When you share something that you are passionate about, it not only makes you more “human” and approachable to your customers, but it can attract those that feel the same! When your company is closely associated with a cause, then you have found a niche market that can help set you apart. By sharing and furthering your cause through your Small Business, you are more easily able to find your target audience. This is where you are wise to focus your marketing efforts. Tracy Higginbotham is a perfect example of a small business owner who closely links her company, Women Ties, to what she believes in ~ the promotion and support of women entrepreneurs! Higginbotham dedicates all her efforts towards that goal. Her belief in the importance of furthering women’s causes can be found in every conference she holds and every blog post she writes. Through this, she has built her brand. Another example is Jackee Ging, owner of The Style Truck. Ging uses her business to promote American made clothing and accessories, some designed by local artists. This cause is important to her and her business reflects that! Veronica Nourse’s quest to “Go Green” with her business, The Cupertino Soap Company, was a way to bring her personal beliefs about our planet into her business. And this is important to the customers she attracts! And there are many other Small Businesses out there doing the same. For myself, I am a strong believer in using my company to further other small businesses. 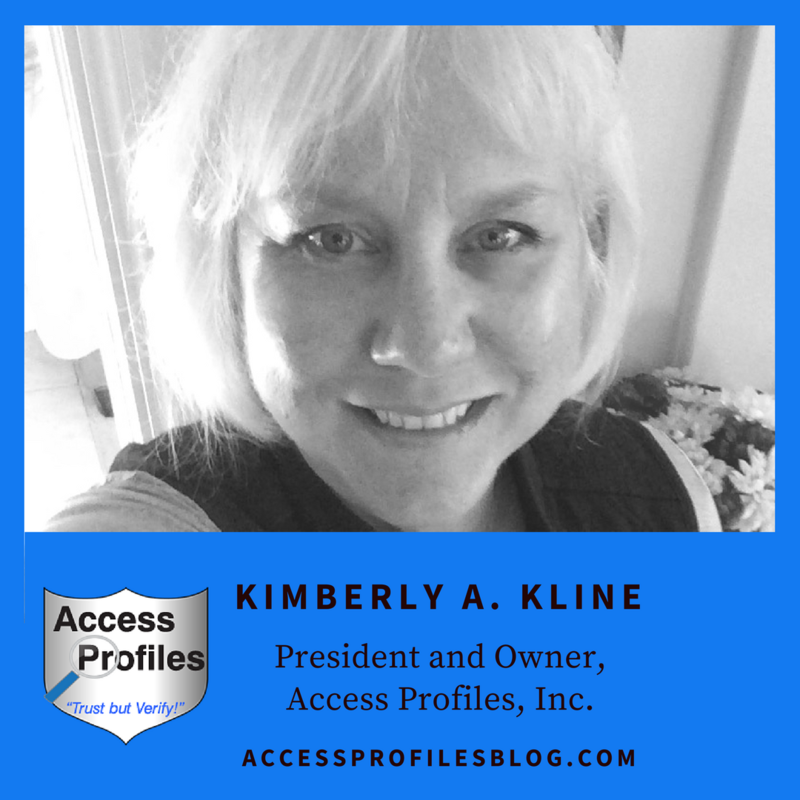 My focus is continually on helping Small Business owners achieve their own success and promoting them in any way possible. I do this by mentoring those ready to dive into entrepreneurship and through my blog articles. My belief that small business is crucial to our economy is apparent throughout my brand. I also freely promote my support of women in business. I share and write many articles in support of equality (for everyone), ending gender and wage bias, and the importance of uplifting women in our society. If, for whatever reason, this means I lose a potential client, then so be it. 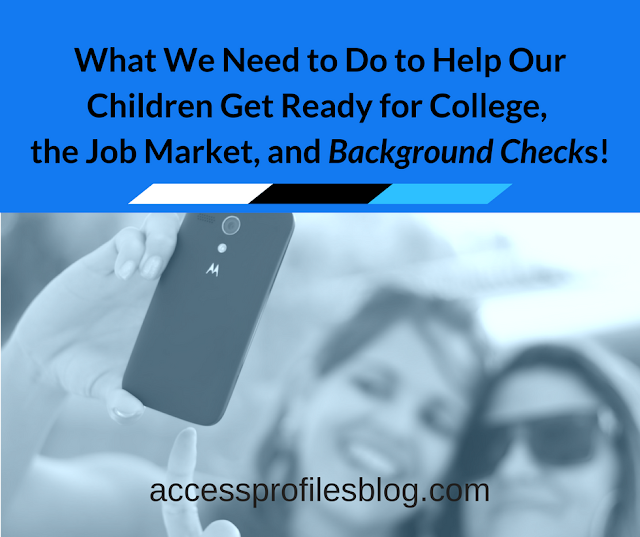 These causes are part of the reason I began my blog and built my brand in the first place. Associating your Small Business with your favorite cause is also a great way to set yourself apart from your competitors, even if they are big companies! The key is to focus your marketing efforts on the cause, or causes, that mean the most to you. Through that, you will find an important audience. And face it, any time you can get recognized, you are a step ahead. We all have certain causes that we believe in, and why shouldn’t we use our Small Businesses to further those causes? creates something of great value. that you can be proud of. Do you share your personal causes through your Small Business? Share your website in our comment section! on your favorite social sites! Find out more About Us and our Background Investigation, Business Mentoring, and Security Consulting services too! 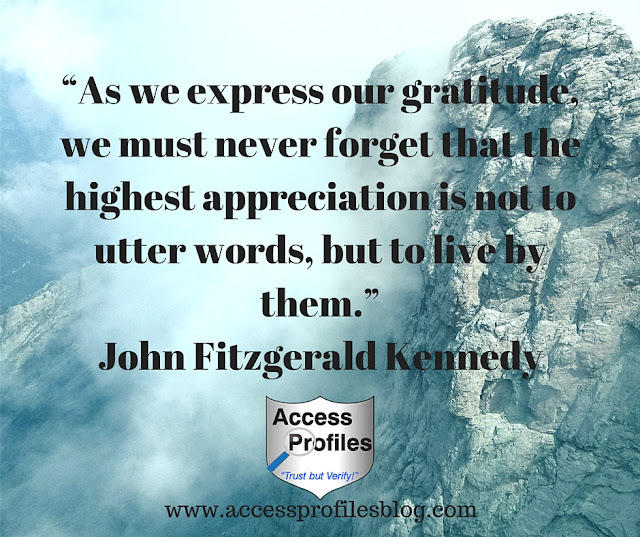 Do You Know What You are Truly Thankful For? The holidays make many of us reflective. We look back on what has already happened, and dream about what is still to come. 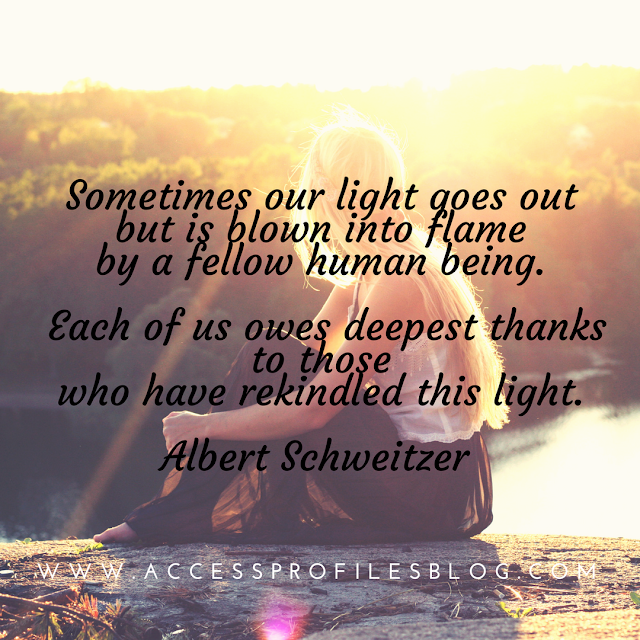 We also take the time to really appreciate the people around us who make our lives worthwhile. And that is just as true for Small Business owners. We all know what it has taken us to get where we are, and the many people along the way who have encouraged, supported, and guided us in achieving our goals. No One Achieves Success Completely Alone! So in the spirit of the season, I am sharing the people and things that I am truly thankful for! They have always been supportive and loving. They keep me as close to “sane” as I can possibly be and their sense of humor often makes even bad days so much better. And my husband is at the top of my list! He always believes in me ~ even when I am having a hard time believing in myself. I will forever be thankful to him for this! My family is also my rock whenever things go crazy. Without them, I never could have survived all that life has thrown at me. Personal obstacles like breast cancer, major back surgery, and the death of my father were only manageable because of them. The same goes for the trials of starting and running a small business! From the beginning, even when I had partners, my family was in my corner. And when I decided to go it completely alone, they were there for me more than ever before. They are the reason why I get up each morning and try to do my best every day. My family keeps my inner light glowing with purpose and love. I believe in the future. They are mindful of the people and world around them. They are caring and empathetic. And they are fiercely loyal. Through them, and their friends, I see what is great about our country and our world. They make me believe that there are good things to come. I am also truly thankful for my friends ~ both those I know in person and the ones I only “know” online. I am lucky enough be surrounded by a great group of friends who I can share laughs with and who have been there for me. Then there are others who I have connected with mainly through my business. These business friends are no less welcome. All are good people ~ and I value them. Next, I am thankful for my business. I cherish the freedom to steer it in any direction I choose. I also know how lucky I am to be doing what I love ~ and how grateful I am that it is in the service of others. I love using my business to pay it forward. Helping others achieve their own success is a great feeling. Whether it is helping them find their best hire, or mentoring them in starting their own small business, I am thankful for the opportunity to make a difference. While there are surely more I can add to the list, it is these that I appreciate the most, each and every day. They make me thankful for the life I have now and the one to come. Please Share them in the comment section below! or take it to the next level? focused on You and Your Small Business! 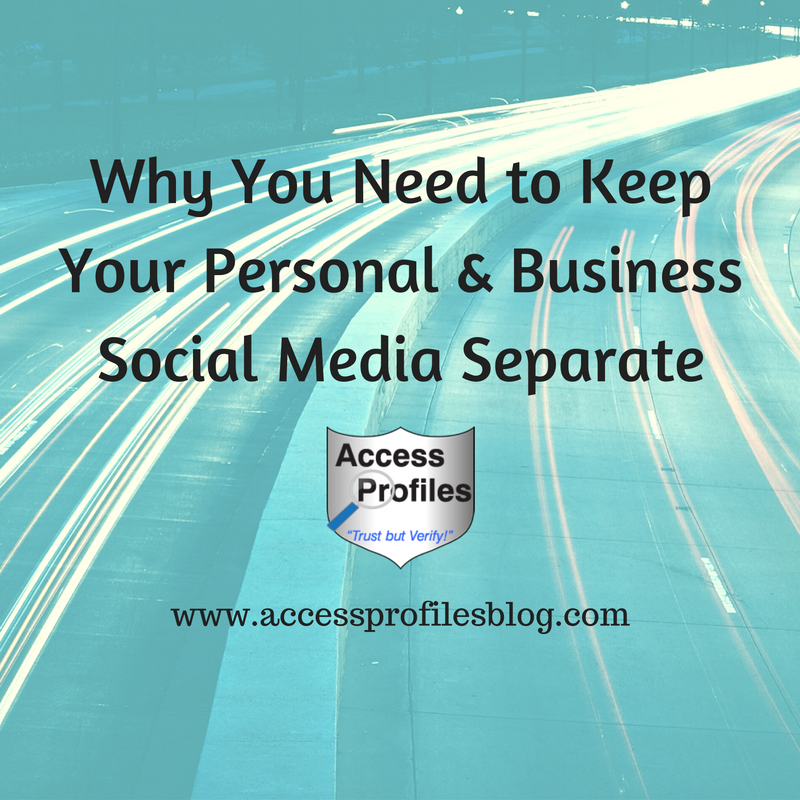 I keep my business and personal social media separate. While on some social sites I only have a business profile (LinkedIn is a perfect example of this), there are other sites where the lines could become blurred. This is especially true of Facebook, Pinterest, and even Instagram. On these sites, I either have a completely separate business and personal profile, like I do on Facebook, or, at the very least, I have set up ways to differentiate the two (like on Pinterest, where I have set up one board solely devoted to small business posts). No matter what site I am on, however, I recognize that too much mixing of my personal and business life is rarely a good idea. than during this past presidential election! The prevalence of divisiveness and mean spirited behavior was startling to me. And I had no desire to get in a “war” that could have more impact on my small business than I would like. It became abundantly clear that mixing personal and business posts did not make sense ~ for me or my business. Alienating potential clients is never good for business. Anytime you share potentially controversial posts, you run this risk. That is why I avoid strong political and religious posts. You never know when what you say can keep you from landing a customer. Your “brand” should always be consistent. This is whether that brand is associated with your small business or it is your own professional persona. Anyone wanting to do business with or hire you, will look you up online. Posts or shares that go against the image you want to portray are detrimental and may even be dangerous to your success. Keeping “crazy” posts from friends or online connections off my business pages is the number one reason I separate the business from the personal. You have very little control over what others post. And even if you hide them from your page, it may not be before their posts have been seen by someone they may offend. This could potentially lose you business or keep you from getting hired. That does not mean your online business persona needs to be free of personality and passion, especially if you have a Small Business. That would be boring! After all, I am my small business, and I want my current and potential clients to “know” me. That is why there is, and will continue to be, some cross over between business and personal on my social sites. 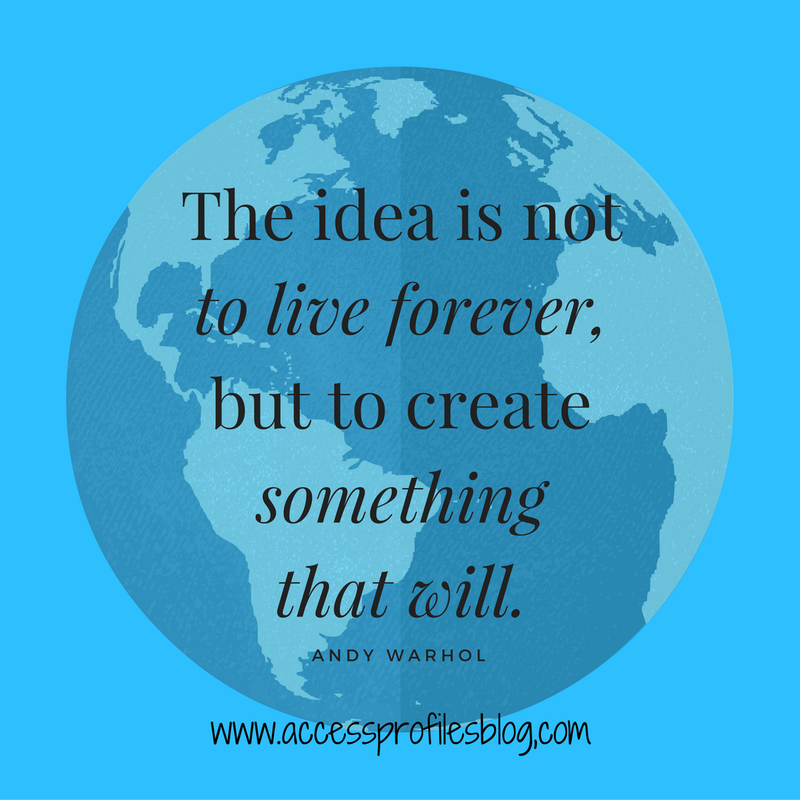 I share my blog posts on both my business and personal Facebook pages. My Instagram posts often cover both professional and personal interests ~ things about myself and my travels. However, even when sharing these personal things, I am constantly vigilant to keep my brand and the success of my business squarely in mind. probably should not have been posted. Having separate personal and business pages makes the most sense. It shows a clear delineation between those two facets of your life. But even then, you need to be careful. People are naturally curious, and most will check out both. Friends will visit your business page, and clients will often take a look at what you post personally. That is especially true if your persona is an important part of your business ~ and I think this is true of most small business owners! In some cases, having two separate pages is not possible, like it is for me on LinkedIn. And it certainly helps that I consider LinkedIn to be a strictly professional site. But that doesn’t mean I don’t practice vigilance. In fact, I am especially careful when it comes to posting on these sites. However, if you either can’t have, or for some reason don’t desire, separate business and personal social pages, then it is important you recognize the potential problems. The best thing you can do is to take a few steps now to protect yourself and / or your small business. Find out what is “out there” ~ Do an online search of both you and your business. 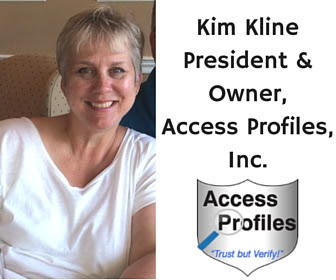 Clean Up Your Social Profiles ~ take a look at your posts through the eyes of friends and connections (this is possible on many sites by clicking on a “view page as” type of option). 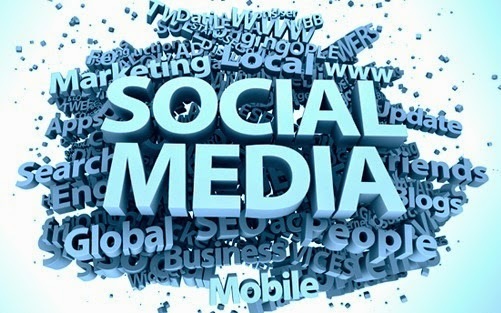 Remove any posts that may shed you or your business in a negative light ~ You may even consider “hiding” or blocking friends and connections that consistently post things that are inflammatory or questionable. This is the same advice I constantly stress to anyone looking for a job! “Your best course of action is to imagine anything you post could possibly be seen by a wide variety of people - your family, friends, neighbors, teachers, employers, and even those that are strangers to you. Using that as a guide, do you still want to share that post? Asking yourself that question BEFORE you share is the wise way to go.”; excerpt from “Social Media, Background Checks, & Company Policy: The Good, the Bad, and the Ugly!. Businesses would also be wise to use this posting guideline. Sharing things as if your customers were looking makes sense. After researching your company, and fixing what you can, the best course of action is to be more careful in the future. Simply being aware of what you post, and the impact it may have, is often enough. of your social media “likes”! “Liking”, or reacting in any way, to a post says something about you. It can reflect things you find interesting, funny, or even things with which you disagree. The problem becomes when those seemingly innocent “likes” alienate potential clients or generate an image about you or your company that you never intended. Find out more in “Ready to Improve Your Brand? Why You Need to Think Before Clicking ‘Like’!”. If you have employees, it is just as important that you consider their social media activity ~ especially if they are an online “face” of your business. Just as it is important for you to separate the business and personal, it is also true for your employees. That is why it makes good business sense to create a sound social media policy from the start. You need to stress the importance of what your employees post and how it can reflect on your small business. You need to project an image that will attract, not repel, potential and current clients. Making sure it is consistent and supportive of your brand is key. Your Personal and Business Social Presence? Please share why, or why not! We will work with you to put you and your business in the best light! on Small Business Tips and News! Our Happy Clients have to say too! 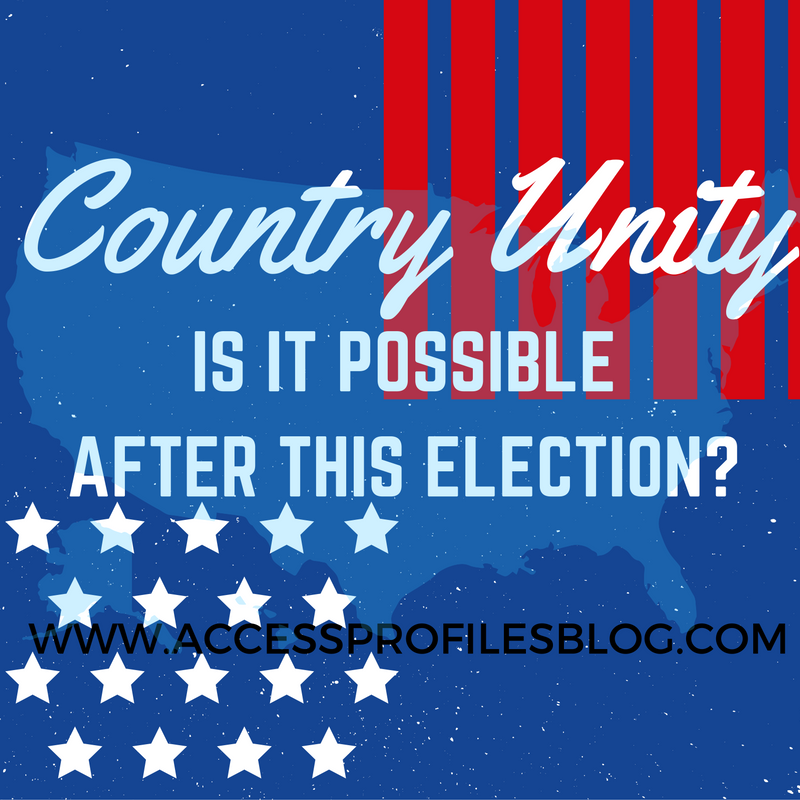 Country Unity ~ Is it Possible After this Election? This election has been a divisive one. Tolerance is at an all time low. even among friends, are often turning ugly. The example set by our two candidates deserves some of the blame. They have often resorted to their own game playing, low blows, and inflammatory statements. These elections have often been “more about show than substance. Media attention has been rampant, but not about what is important. Instead the focus has been on whatever outrageous statements the candidates make about our country and each other”, excerpt from “These Elections are Driving Me Crazy”. While uncivil behavior by our candidates is certainly true, I am more concerned about what this election has done to us, our nation’s citizens. There has been a level of mean spiritedness and immaturity between each candidate’s supporters that is unlike anything I have ever seen. Instances of name calling and even physical violence are not uncommon. Not to mention the inappropriate and simply contentious social media posts that have cluttered my Facebook and Twitter feeds. People ranting not just on their own pages but on the pages of others. Posts by users that call out or belittle those that have an opposing view to their own. I have even seen people“unfriending” connections all because of what has been shared online. Where has this gotten us? The number of those that refuse to respect, or at the least accept, that each of us have our own choices and our own beliefs has grown. Many of us refuse to recognize that not everyone’s point of view will match our own. 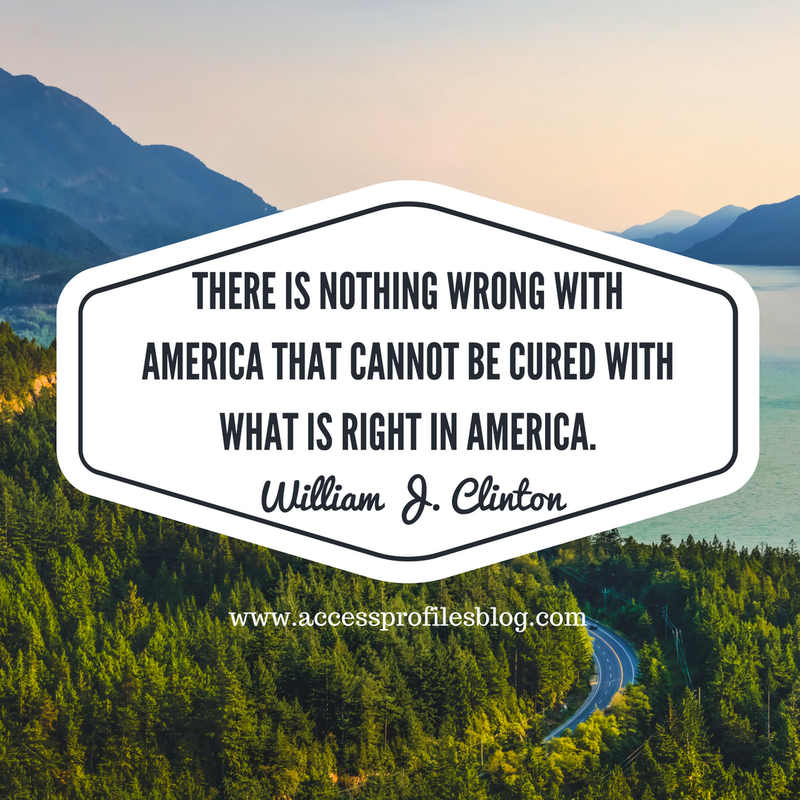 Instead of acknowledging that everyone has the right, and the duty, to vote their own conscience, there are those that believe their choice is the only “right” one. Even labels like “conservative” and “liberal”, Republican and Democrat, have taken on a new meaning. Instead of simply being parts of the larger whole, to some of us they now serve to identify our enemies. In reality, I believe very few of us fall squarely within the parameters of any one of these labels. Most likely, many of us would fall somewhere in between. However, the biggest problem with all of this, poor behavior and labeling alike, is that it just serves as a way to divide us more. And what happens after the election is over? What then? to live and succeed as one? and let our civility and respect deteriorate? for the betterment of all? Even if the election does not go the way you wanted, aren’t we still all US citizens? People need to realize that we are all much more alike than we are different. Instead of embracing these similarities, many choose to focus on our differences instead. This simply keeps the cycle of divisiveness going. We all want love, family and friends, and security. We all have goals for ourselves and those we love, and we want success in achieving them. Most of us also want peace and believe in helping our fellow man. I am not ready to throw in the towel. I want a better world for myself, my children, my friends, and everyone else in this country. “We hold these truths to be self-evident, that all men are created equal, that they are endowed by their Creator with certain unalienable Rights, that among these are Life, Liberty, and the pursuit of Happiness” (Declaration of Independence). This does not mean that in our pursuit to make our own lives happier and worthwhile, that we can deprive someone else of their rights. There is no justification for it. That does not mean we can't strive for change or fight injustice. I believe in peaceful protest. It is our right and duty to stand in support of what we believe in ~ especially if that stand is made in defense of our fellow human beings. Protest as a catalyst for change is part of what makes this country great. But when those protests escalate to hurled insults, disgusting diatribes, and acts of violence, then …….. Through our words and actions, we must present a united front in support of a caring and respectful nation. And the best way to accomplish this is to Practice Empathy! When we are empathetic, we take the time to put ourselves in someone else’s shoes. We consider their feelings and care about them as people. We want them to be happy and fulfilled. This is the goal to which we should all strive. Politics, and especially this election, cannot and should not deter from that. Belittling, name calling, and physical violence are never the answer. Real strength comes from unity. really stand for if not that! Even if we continue to believe in and want different things, that shouldn’t mean we can’t live and work together peacefully and successfully. 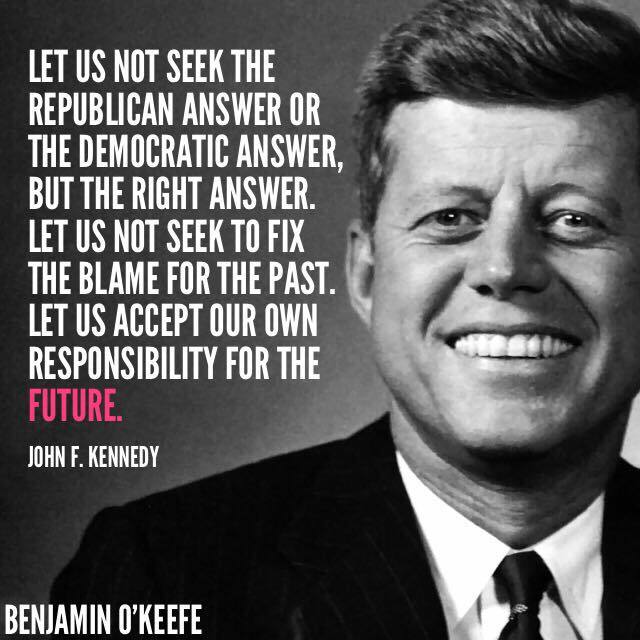 Indeed, it is the only way we will continue to grow, strengthen, and succeed as a nation. 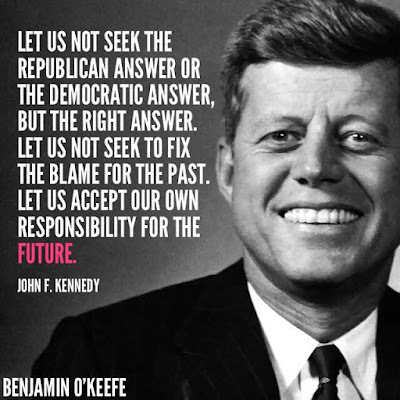 It is time to move beyond the divisiveness this election has created once and for all. You will receive one new post each week.